The Indian markets have outperformed most of its peers in CY12, after significantly underperforming in CY11. According to Antique Stock Broking, CY13 will surely lay foundation for strong outperformance in CY14. 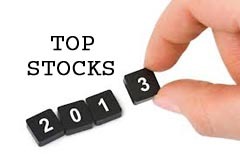 Glance through the 11 stocks that are likely to give you wonderful returns in future. Antique expects DTH penetration in India to be ~49% over the next four years. Also,Dish TV India Ltd. (Dish TV) is the leader in the six player market with ~28% market share. bAntique believes the company is expected to benefit from the Phase II and III of digitisation due to its strong presence in tier II and II cities. Expect subscriber additions to improve from 3Q onwards led by; onset of festive season and some shift from cable to DTH in Phase I locations. An improving macro normally leads to an improvement in consumer sentiment and a consequent uptick in high discretionary spends. Antique sees indication of rates easing-off, re-rates multiples for the rate sensitives (cars) and sees Maruti benefiting from all of the above. Also, given its fat import bill (net imports at USD1.7bn), it also benefits from any INR appreciation. Antique believes the only argument for the bear (competitive pressures) is also fading. Antique recommends ONGC as a top buy as the development of 37 marginal fields will entail almost 10% Year-on-Year (YoY) growth in FY14/15e. Also ONGC’s subsidy burden is expected to decline going forward as lower under-recoveries owing to potential diesel price hikes, LPG cap and decline in kerosene consumption would induce the Govt. to overhaul the current subsidy sharing mechanism of fixed discount. Despite adverse macro-environment, Larsen & Toubro, has reported strong order-inflows in FY13 so far. The company, believes Antique will stand to gain from any pick up in infrastructure investment activity, as peers continue to struggle due to stretched balance sheets. The company is well on track to meet its order-intake guidance and margins are likely to remain healthy and execution strong, which will ensure strong earnings growth during FY12- 14e. L&T remains a preferred large-cap capital goods stock. ICICI Bank continues to remain a strong franchise which has continued to deliver well on its articulated 4C strategy: CASA ratio (+40% levels), costs under control (Cost to income ratio at 40-42%), lower credit costs (negligible slippages), and strong capital base (Tier1 ratio at ~12%). Antique forecasts a rise in incremental NPL and consequently NPL provisions/loans, it may stay close to the guidance of 75bps. Also, CIL’s non-executive wage costs (~50% of operating cost) are revised every five years. The last wage revision was effective from July 1, 2011 and has been provided in FY12. Hence, for the next five years, wage cost will grow in line with general inflation levels. Antique believes Dr. Reddy’s Laboratories (DRL) has one of the best generic product pipelines in the US. The breadth of DRL’s pipeline insulates it from potential revenue shocks arising out of specific approval delays. Antique expects DRL to demonstrate strong earnings growth of 17% over 2011-2014e driven by; a series of product launches in the US; momentum in the domestic market; accelerating growth in the Russian market and margin improvement on the back of rationalisation of costs and an improving business mix. Antique is bullish on the company’s high quality assets in the portfolio. On a consolidated basis, the company’s asset portfolio consists of 33.3mmt of consolidated cement capacity (35.9mmt by 4QFY13e) supported by 672MW of CPP, 165km of six lane access controlled expressway, 1,700MW of power capacity and real estate land bank. Antique believes they have the potential to generate robust cash flows on a steady state basis, which can be utilised for deleveraging/expanding the future asset base. regulatory changes on securitisation through the assignment route. However, the lender appears to have tided over the liquidity crunch by moving smoothly on to the PTC route while consolidating its retail funding base. Antique expects RoAs to clock 3.3% level for FY14e after building in 30-40bps of spread compression and keeping LLPs at a conservative 190bps. After the Government of India increased the prices of non-filter cigarettes in FY 09. there was a shift towards filter cigarettes. The shift in turn led to ITC’s market share in the cigarette industry growing from 74% in volume terms to approximately 84-85% currently. A similar scenario is set to emerge after increasing number of states are putting a ban on chewing tobacco products, thereby providing a huge base for the cigarette industry to exploit.